This week, the Tuesdays with Dorie bakers are doing a rewind, which is a free-for-all to bake any recipe that the group has made in the past. I decided to make Granola Grabbers, which the group made before I joined. I’ve heard a lot of good things about these cookies, and this was a good reason to give them a try! I made the full recipe and got 48 cookies (the recipe says it will make 40). The recipe calls for 3 cups of granola without dried fruit. I often make my own granola, so I was going to do that, but my granola has lots of nuts and coconut and so does the cookie recipe, so I was afraid of nut-and-coconut-overload. Instead, I bought a box of Kellogg’s Low Fat Granola without raisins. How it went: I was amazed at how much “stuff” there is in these cookies! Three cups of granola, plus raisins, coconut, peanuts, almonds, and wheat germ. I had a big bowl filled with all of those ingredients, ready to be mixed into the cookie dough. Would it work? Would I have a dough that could be formed into balls? It did work. I don’t know how, but it did. How it tasted: The dough was delicious! The flavor of the granola really came through, so if you make these, be sure to pick a granola that you really like. I liked these a lot; they’re full of crunchy, chewy, tasty goodness. My husband (predictably) thought that there were too many raisins and that there was “too much non-cookie in the cookie.” I knew these wouldn’t be a hit with him, so I had already planned to take them to work. They were quite popular with my coworkers, as evidenced by the photo of the almost-empty container. Are you ready to make these? Look on page 82 of Baking: From My Home to Yours, or here on Google Books. These do indeed look good. 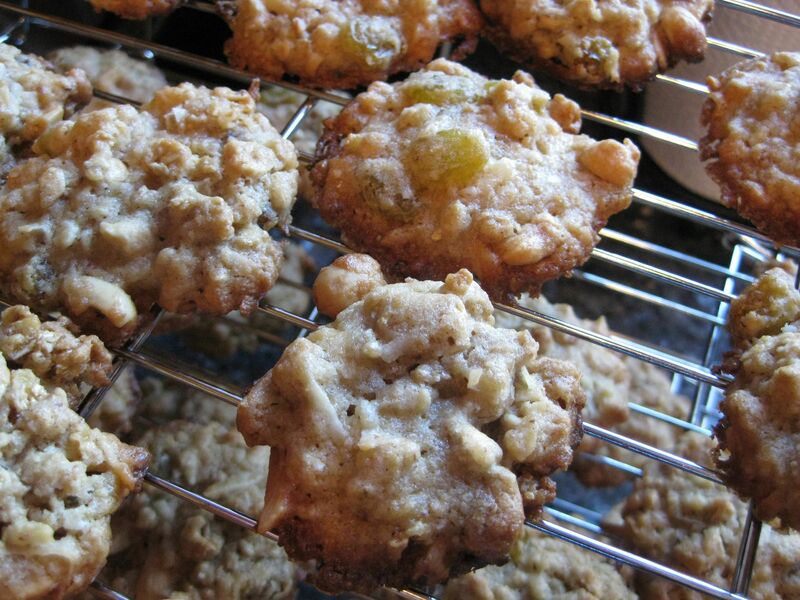 It’s a great name for a cookie – Granola Grabbers. Sounds like they were definitely grabbed. One of my absolute favorites! 🙂 And yours look wonderful! I almost made these, but didn’t have enough granola. These are so good. I love your photo of layers of cookies! This is on my list to make. Glad this was a good rewind! Glad they were so popular at work! I would have to side with your husband on this one–one raisin is too many for me, but maybe I could try them with figs/dates/prunes because they sound yummy and have a great name. I must say that I have rewound these cookies so many times they are now a permanent rotation around here. They seem to be a tad bit healthy so the swimmers all love them…yours look great! Happy Thanksgiving! I love granola, and I love cookies, so these look perfect for me! yum!! These sound outrageously good! What lucky co workers….man, I wish I were one of them!!!!!! I don’t think I’ve made these and I love granola. I just made homemade granola today. I’ll have to add these cookies to my list of cookies I need to make soon. Happy Thanksgiving. The cookies look great and the empty container says it all! I have been wanting to try this one for a while, too. They seem like they’d be a good one to make at the beginning of the year when people are trying to eat healthy. Have a great Thanksgiving! Your granola grabbers look perfect and like a great snack to prep for all the rich pies and treats with the holidays! I love the empty bowl pic, it always feels good to have your treats enjoyed! I love your comment that “the dough was delicious.” This is very important! It’s one reason I don’t make angel food cakes very often–the batter isn’t all that tasty. Yep, I remember thinking the same thing – so much stuff in there. But they were soo good. Those cookies look terrific. I like ALL of the stuff that’s in them! i never did make these but i do love granola!! i’m thinking a honey granola would compliment these well. gotta try em now! 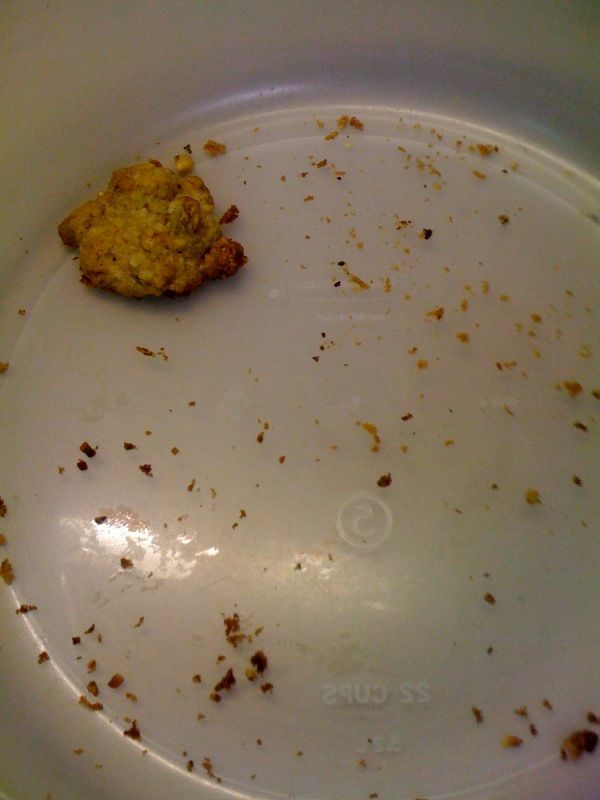 I love the picture of the tupperware container with one lone cookie left in it!